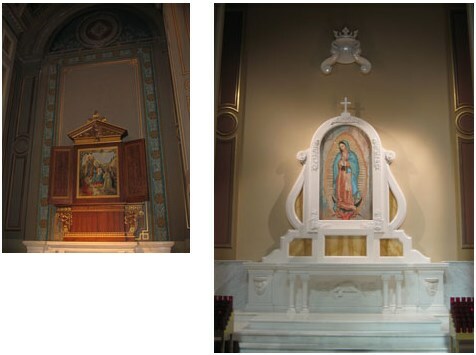 To renovate and restore from years of damage, the side shrines within the Cathedral, and to create new shrines of devotion to Our Lady, St. Joseph and Child, and the two Philadelphia Saints – St. Katharine Drexel and St. John Neumann. 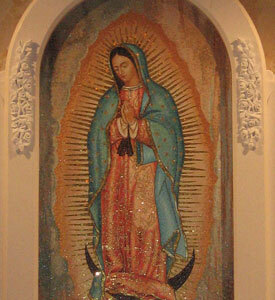 To design and build a new marble mosaic image of Our Lady of Guadalupe. 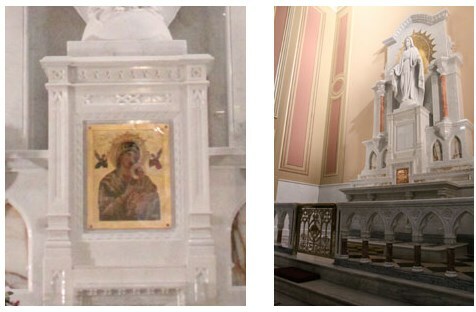 Working closely with Cardinal Rigali, we restored the once Holy Family Triptych Shrine Altar. 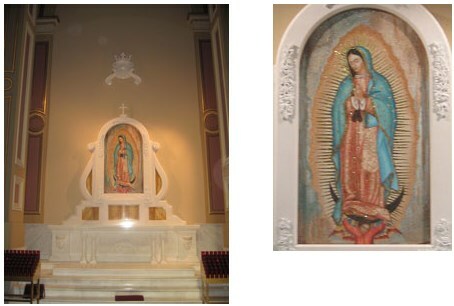 His Eminence had promised the Hispanic/Latino community to put an image of Our Lady of Guadalupe in the Cathedral. Fulfilling that promise, he contacted our Studio to design and build for him a Shrine that would remind the people of the same image that is found in Mexico City. St. Jude Liturgical Arts Studio, with our team of artists in Italy, using time honored traditions of the Venetian mosaic, was able to re-create the exact image of Our Lady. You can see from the images and pictures, that from the folds of the garments to the stars on her outer garment, each detail was painstakingly duplicated to create a Shrine that brought the faithful to tears. The Mosaic image is 7’0″ in height. 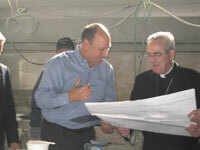 The Cardinal was able to view the work in progress in our Marble/Mosaic studios in Italy shown here with our Director Louis R DiCocco,III viewing drawings and details. The architectural marble was designed to complement the other new Shrines in the Cathedral but more importantly, was created to be something new and different that was worthy, and to tell the story of Juan Diego. Note the intricately carved roses that surround the image and the bookend matched yellow Siena marble panels that are used within the arched recessed areas which truly complement the beautiful image of Our Lady. 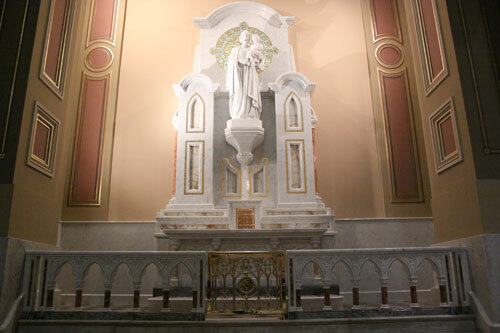 The altar that was incorporated into this new shrine was one that was used by St. John Neumann who was one of the original founders of the Cathedral and who, as Philadelphia’s 4th Bishop, began the actual construction of the Cathedral. 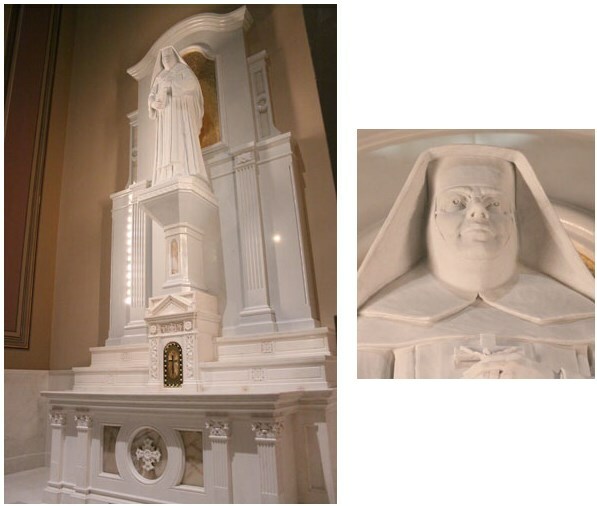 St. Jude Liturgical Arts Studio built a reredos to complement the marble base, again, matching the marbles and mosaic, and crafted a seven foot high marble statue. 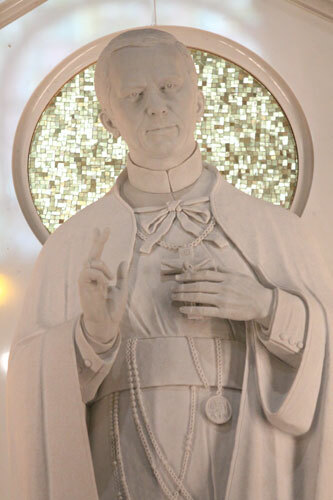 The statue is highly detailed with the features of St. John Neumann and he is shown wearing the cassock of the Redemptorist Fathers. 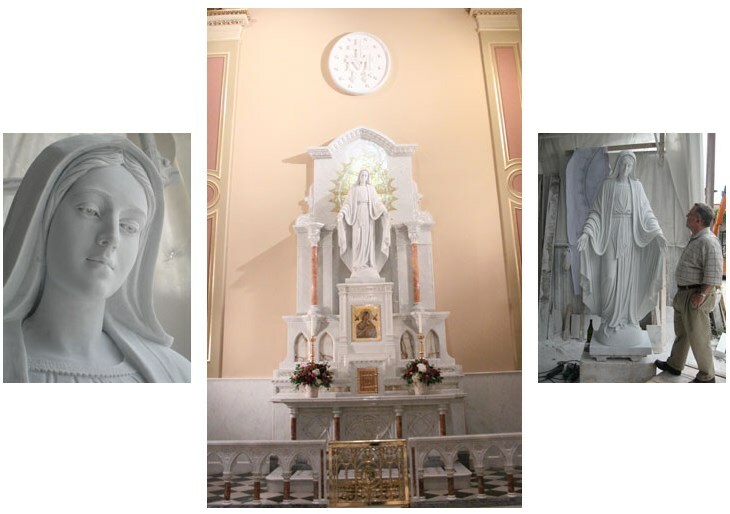 Citing and recommending the images of Our Lady of the Miraculous Medal and Our Lady of Perpetual Help, Cardinal Rigali had asked us to create a shrine to our Blessed Mother that would be worthy for the Cathedral. St. Jude Liturgical Arts Studio designed and built these new shrines to complement all the existing architecture in the Cathedral and by removing the old artwork that was done back in the 1970’s. 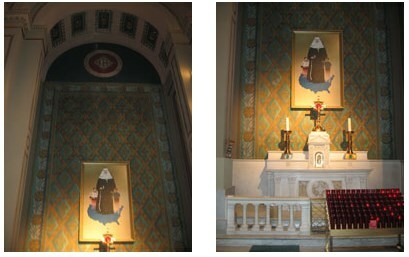 St. Jude Studios recognized an altar that was found from a closed church (St. Boniface in Philadelphia) as potentially suitable for this project and proceeded to resurrect and re-furbish all of the pieces, including the altar rail and the base bottom. 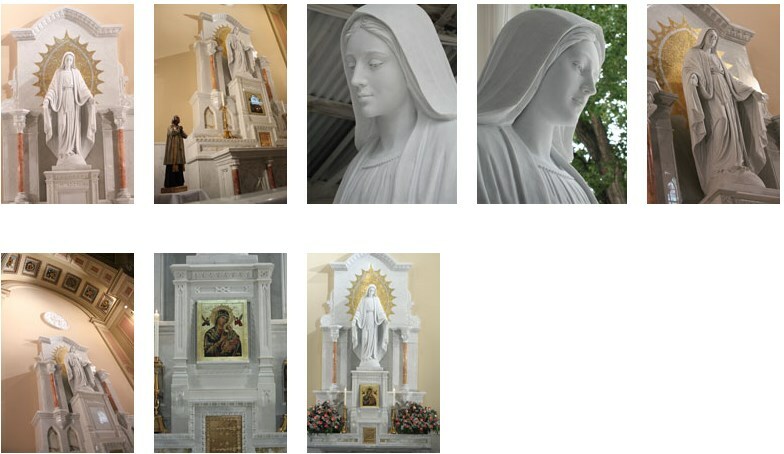 We then fabricated, from our Studios in Italy, the entire top area, including the brand new seven foot sized statue of Our Lady. The mosaic and the columns were all fabricated in conjunction with the existing marble. 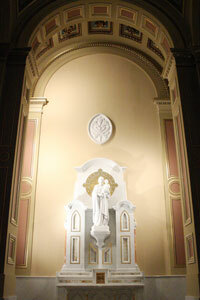 The marble medallion reflects the Miraculous Medal and the restored Our Lady of Perpetual Help icon was gifted to the Cathedral by the Redemptorist Fathers and enthroned in June 2009. St. Jude Liturgical Arts Studio restored the back wall, including medallions and moldings that were water damaged over the years. All new paint to resurrect the faux molding and recessed panels and all of the polished marble, including the new marble — matching the 150 year old altar base, were completed by our team of excellent craftpeople. Once again, the “before” pictures show a dated shrine done some twenty years ago. Cardinal Rigali envisioned having a devotional image of St. Joseph as the protector and head of the Holy Family and beloved patron of the Universal Church and fatherhood. 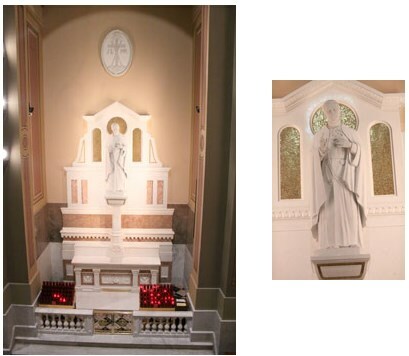 Included in this new shrine is the seven foot high statue of St. Joseph and Child and the starburst mosaic. The St. Joseph Shrine was fabricated by our studios to complement the shrine of the Blessed Mother. We were able to successfully match marbles from 150 years ago. 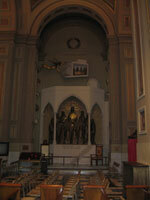 Also, we were able to complement, both in materials and designs, the altar that was from St. Boniface Church. 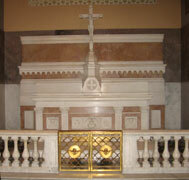 All new marble wainscoting was added to enhance the shrine area. The client was able to view the statue as a “work in progress” at our studios. Our studios restored the altar base and built and enhanced a reredos behind it to support a new statue of St. Katharine. St. Jude Liturgical Arts Studio built something that is both appropriate and magnificent.